Launched in February last year, Bambu is a Singaporean B2B robo-advisor services provider delivering sophisticated automated online management solutions to financial institutions in Asia. Bambu has developed unique solutions for each segment of the market: a white label platform for financial institutions to offer robo-advisory to their customers; “Robo-in-a-box,” a one-stop-shop for any company to offer end-to-end digital solutions to retail investors; and the Intelligent Advisor, a propriety algorithm-ranking tool for relationship managers to improve customer experience targeted at high net worth investors. The company has signed partnerships with notably industry players including Tigerspike, Thomson Reuters and Finantix, and has already secured its first revenue contracts with two firms. Bambu has over 90 prospects in the B2B pipeline for the year to come, the company said. Bambu, a SuperCharger 2.0 finalist, will join the fintech acceleration program in 2017, alongside seven other teams including Clare.ai, an artificial intelligence startup, Entersoft, a cybersecurity company, and FinChat, a regtech company. 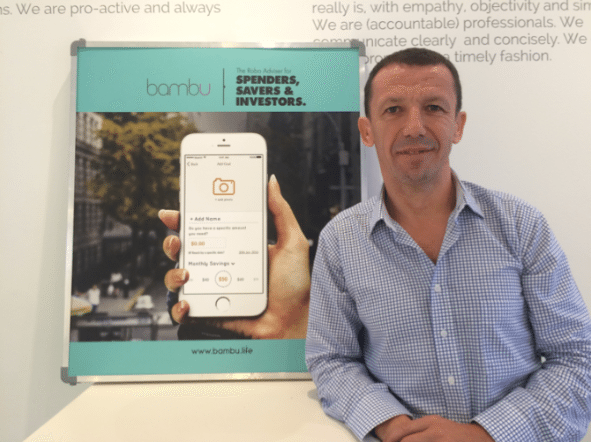 Bambu is now looking to raise its Series A funding round. Prior to launching Bambu, Phillips, a financial services expert who has worked in Asia for the past 25 years, served executive positions at the likes of E*Trade, ITG and CLSA Blocsec. Phillips also consulted for Hong Kong-based B2C robo-advisory company 8 Securities. Today, we catch up with Phillips to learn more about what’s next for Bambu, the story behind the venture, and get the founder’s insights on the state of fintech and robo-advisory in Asia. In your own words, what is Bambu? Bambu is a collection of people who are aiming to create something that is bigger than the value of themselves individually. We happen to be in fintech. We build and provide digital savings and investment solutions for businesses that want to deliver best of breed products to their customers. What is the story behind Bambu? Why did you start this particular venture? Sometimes in life a door opens and it just feels right to walk through it. I am 49, have been in Asia since 1990, have worked in fintech since 1999. I was MD for E*TRADE Asia and built two Alternative Exchanges. 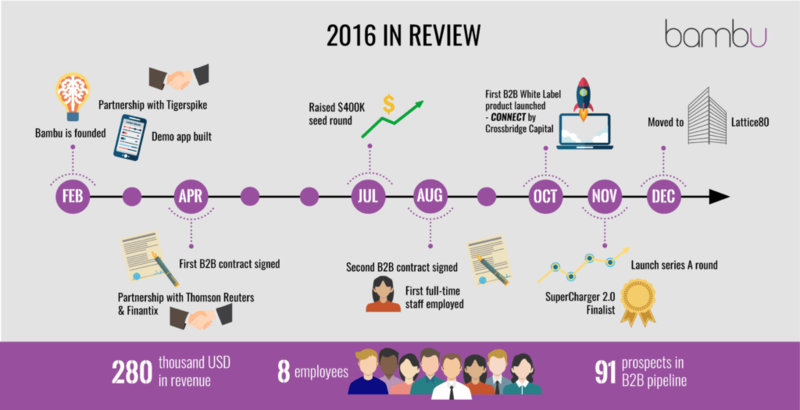 In 2015, I spent a year with 8 Securities, as they launched Asia’s first robo-advisor. There was huge interest. It was clear there was demand for a B2B robo. So I set Bambu up in March 2016. I built a prototype and spent a few months out selling it. When I landed our first customer and had signed revenue, I started the business. We are different. We are revenue led. It’s the only way. In the B2B SaaS world, the only marker you have to hit is revenue. There are not many problems that a business faces that more revenue can’t solve. What is Bambu’s long-term audacious goal? Dominate the B2B robo-advisory market in Asia, build an E-Commerce Robo Saver Exchange and create dynamic risk assessment powered by context sensitive neural networks. Want to know what that all is? Come and see us! We also want to make significant returns for everyone who works at Bambu, every investor who backed us and every customer of Bambu. Besides Singapore, which markets do you see fit for your business? It is clear there is demand everywhere. Best way to think of it this way: “Will people save and invest in a more manual or digital manner in the future?” It’s only going one way. There are opportunities in every market, financial and non-financial, and we have built products suitable for every segment. Our goal is to provide our robo-advisory service to every market. What are the main challenges for robo-advisor adoption in Asia? As a B2B provider, there are more opportunities compared to challenges. In my 25 years, I have never seen an opportunity like this. It’s huge. My advice for B2C players is to stock up high on cash with a minimum of US$50m in marketing to dominate a market. The real winners in robo will be the companies that have gained trust and built strong relationship with their customers. Such companies are Ant Financial, WeChat, KaoKao and domestic banks. What are the main differences between the robo-advisory business and industry in Hong Kong and in Singapore? The biggest difference is that people in Hong Kong are more likely to be traders while in Singapore they are more likely to be investors. Robo will grow in both but in Hong Kong I think you need a product that gives more ability for the customer to have input to the portfolio. Both markets will see huge growth in robo. A lot of experts and industry observers argue that Singapore has the potential to become Asia’s fintech capital. Do you agree with that? The world leading fintech center is China. In the rest of Asia, Singapore certainly is positioning itself as a leading center to base yourself in to expand throughout the rest of the region. Huge support from the Monetary Authority of Singapore and the government are the key reasons. Fintech regulation in Singapore is evolving at a pace never seen before. The regulators have stepped up and are doing a superb job. They have such a tough ask. They need to evolve and also safeguard. It is a balancing act but they are changing like never before. India and Indonesia are the other markets making big strides. But in reality all of Asia is one massive fintech opportunity. A tech savvy, mobile, young market that is the most populous in the world. Challenges do exist but they are far outweighed by the opportunity. We will look back in ten years and say: “Wow, imagine you were there at the start of fintech in Asia ten years ago.” We are beyond fortunate to be here now. Embrace it, grab it and build. That’s what we are doing. Bambu is opening an office there. I lived in Hong Kong for 13 years. Love it there. We see it as the logical expansion for Bambu.